India got off to a winning start in the 28th Edition of the Sultan Azlan Shah Cup by edging Japan 2-0 in Ipoh. It was a match largely confined to midfield, with attempts at goal were few in between. But India deserved the points for making good the chances created and had the lion share of possession in the match. The first quarter was rather lack listers as both teams were sizing each other up with play largely confined to the midfield. Varun Kumar made good India’s first penalty corner in the 24th minute, his hit sailing past Japanese custodian Yusuke Tanako. Try as they did, Japan could not muster a goal shot and even muffed their first penalty corner in the third quarter. Japan then threw caution into the wind and took of their keeper for an extra outfield player. And they paid a heavy price as skipper Manpreet Singh sent in a precise reverse stick cross that was met by a diving Simaranjeet Singh to give India a 2-0 lead in the 56th minute. Japan were awarded their second penalty corner a minute before time but India held on to take all 3 points . Former champions South Korea returned to the Sultan Azlan Shah Cup fold with a vengeance as they defeated world number 10 Canada 6-3 in an exciting game at the Azlan Shah Stadium. The Koreans ranked 17th in the world took a six-goal lead before the Canadians found their scoring touch. Korean coach Shin Seok-kyo was pleased with the game but felt that they should have kept up the momentum in the last quarter. “It is good to get off with a start especially against a top team. We want the players to keep up the winning momentum as it will give them confidence for the coming matches. “We are here to win the title as it has been too long since we made the final in 2010,” he added. The Koreans won the title first in 1996 and were joint champions with India in 2010. The Canadians best showing was in 1995 and 199 when they finished in fourth place. The Koreans are making a comeback to the tournament after a three-year lapse. Their performance showed that they have enough firepower to push for a final berth. The Koreans took a 3-0 lead over Canada by the end of the first half. Goals scored by Kim Jung-hoo ( 14), Lee Nam-yong (19 ), Jang Jong-hyun in the 20th minutes allowed the former champions to take a comfortable lead and stay in front. Lee Nam-yong added the fourth goal in the 31st minute with another field attempt. The Canadians were hardly in the game as they had to backpedal numerous times to stop the speedy Koreans. Nam-yong was again on target in the 43rd minute with a penalty corner goal while NJong-hyun scored his second in the 44th for a 6-0 lead. Canada scored their first goal in the 45th minute off a field attempt by Mathew Sarmento while Adam Froese converted a penalty stroke a minute later to reduce the deficit. Canada coach Paul Bundy was satisfied with the performance and felt that the players did well to stage a late fightback. “This a good tournament to play in and we are pleased to be here. We have five changes form the team that played in the world cup and this is an opportunity for the young players to stake a place in the team for the world series in April,” he said. IPOH: South Korea claimed the early favourites tag with a 6-3 win over Canada in the Azlan Shah Cup here on Friday. World No 17 Korea outclassed 10th-ranked Canada in every department to secure the win. Kim Jung Hoo (14th minute), Lee Namyong (19th, 31st, 43rd) and Jang Jong Hyun (20th, 44th) scored for the Koreans. Canada replied through Matthew Sarmento (45th), Adam Froese (45th) and Fin Boothroyd (50th). Korea coach Shin Seok Kyo is now looking forward to erasing his team's Asian Games nightmare by lifting the title. "We finished fourth in last year’s Indonesia Asian Games which was poor. We are now rebuilding our team and paying special attention on fitness. 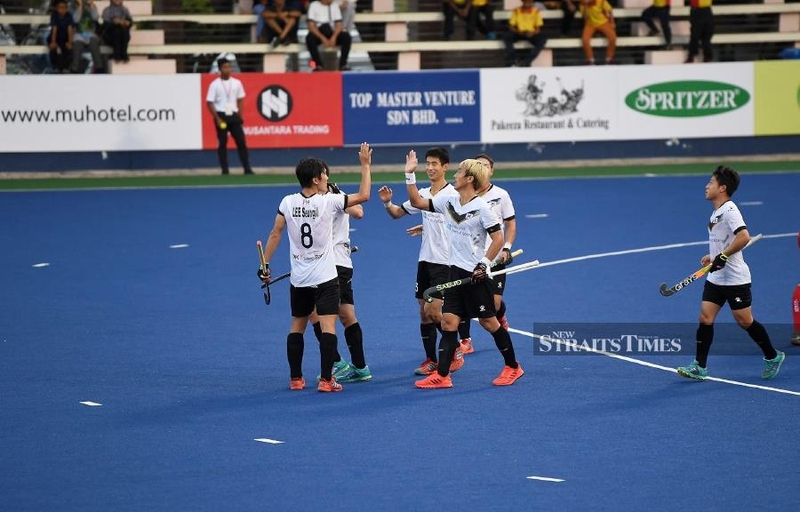 “We want to become champions here in order to boost our confidence for the FIH Series Finals (Olympic Qualifier) in France in June,” said Seok Kyo yesterday. As for Canada coach Paul Bundy, the score did not matter as his team are here to test new players and tactics. "After the Bhubaneswar World Cup, we decided it was time to play a different style in order to progress. “That's why we have brought five young players and are working on new format and tactics. "Credit to Korea because they scored world class goals, and credit to my players also for trying to make a comeback, but I'm still not happy with the overhead flick decisions. "The rule was introduced in the World Cup, but until today, decisions vary among umpires. There is no consistency, and this could lead to injuries," said Bundy. In another match, India defeated Japan 2-0. In the opening match of 28th Azlan Shah Cup India beats Samurai 2-0. India beat Japan by 2-1(in 2016) and 4-3(in 2017). Mandeep Singh netted Hat trick in 2017 edition against Japanese. It is India’s 223 international tournaments since inception, India have won 53. In 1701 matches so far, India had won 937. It is 22nd appearances in Azlan Shah Cup, India have played 127 matches and won 59. India won the Azlan Shah Cup on five occasions (1983, 1985, 1991, 2009, 2010*). *joint winner with South Korea, as final match rained out. Despite a sluggish start, a defence that at times bordered on the reckless and a forward line that slo0wly arose from a deep slumber, India used the opportunities to get past Asian Games champion Japan 2-0 to begin their 2019 Sultan Azlan Shah Cup campaign with a win. For the Blues, it was their first win of the year; a start that many hope winds up with a 2020 Olympic spot. Yet, if this display is any pointer, coaches and analysts need to be worried. India are without some of their stalwarts. But the replacements are no rookies. Getting the team settled took much of three quarters before the sails caught some wind and showed the skill that fans do at times get delirious about. Japan operated with a tight defence. They had no choice. Except for the last match at the 2018 Asian Champions Trophy in Muscat which ended in a tight 3-2 in India's favour, the ones before that had score lines of 9-0, 8-0, 4-2 and 6-0. Siegfried Aikam, the Japanese coach is a huge fan of Indian skills. At the same time, he is acknowledged as a master tactician. Just luck won't take you all the way to the Asian Games gold. At times, Japan had six players at the back, all proficient in man-to-man marking. So tight was the marking in the first two quarters that Shilanand Lakra, Sumit Kumar, Gursahibjit Singh and Mandeep Singh couldn't penetrate. If they had the ball, there was no space. Gursahib learnt what hockey is at this level. He feinted, twisted, ran wide, kept the ball back but the Japanese didn't commit. They waited and waited before plucking the ball away. If Japan have learnt to defend, India couldn't showcase their skills, that at times needs to be described with just one word – sublime. A lot needs to be done in the midfield. Yes, it was the first match of the tournament and the first of the year and no one wants to be harsh. But if trapping, passing, giving turn-overs was of an amateur level, then surely people need to be worried. After all, India is the same team that scored 20 goals in the last five matches. And, Saturday was a struggle. Territorial supremacy is at times an illusion. After the match, Aikman said, "It's always about using the opportunities. I believe we had the better ones. But India won." The first quarter did promise much. Vivek Sagar showed enough enterprise to once again raise the question of why he was omitted from the World Cup side. He was on both the flanks, sprinting around like a hare injected with rocket fuel. His performance fell in the second but he came back into the match in the third and fourth quarter. Nilakanta Sharma had the ball and the space but couldn't do much. In fact, in the third quarter, India behaved like a charitable organisation giving away turnovers. A better-organised team would have punished India. Japan couldn't utilise space so intent were they on defence. Just two penalty corners for India shows Japan's over-reliance on packing the back-line. Maybe, things could have been different if Aikman's boys had played full press, moving in from the flanks. But the mind is a strange creature. Psychologically, India weighed Japan down. Fluency is curtailed simply because the midfield refused to move up front in case an Indian counter-attack caught them napping. Creating a defensive wall seemed to be the only answer for Japan. Patience probably was then a good tactic for India. They didn't press too hard and neither did they go lax. In the Indian defence, Surender Kumar again stood out. Varun Kumar, apart from scoring the opening goal, also saved the second Japanese penalty corner on the line. Lakra seemed jittery, giving away the ball quite a few times while Gurinder seemed wayward as level. Sreejesh made a couple of good saves. Kazumo Murata had a stinging reverse hit stopped by Sreejesh. An early Japanese strike might have put India under pressure. India played both Sreejesh and Krishan Pathak, in alternate quarters. In the third and fourth quarter, Japan needed a strike to try and put pressure on India. Genki Mitani had some wonderful runs putting the Indian midfield and defence under some serious pressure. On the breaks, Mandeep missed a reverse hit while Sumit Kumar mostly ran away from the Japanese goal. It wasn't as if Shilanand, Sumit or Gursahibjit suddenly lost their skill. They seemed lost, out of position and totally at sea to be able to understand what the midfield was trying to create. A coach's voice needs to be in their ears. The match came alive in the fourth quarter with quality strikes, pace, fast-paced flank play and some fast, decisive defensive work. Sumit Kumar found himself in the middle of the circle and did try with a deft reverse deflection but the Japanese goalkeeper saved. Shilanand found space but kept going till he lost the ball. In all this Sumit Kumar also found time to get a green card. In the 55th minute came the move that makes this sport such delightful viewing. Japan made the mistake of giving Vivek space on the left flank and the diminutive midfielder overlapped and sprinted away. It was a move of pure, simple, two touches, the kind you would find in a hockey skill manual. Just when one thought that Vivek had over-played the ball, he pulled out a reverse hit, inches away from the touchline that found the stick of Simranjeet Singh, the deflection rising high into the net. At 2-0, the Japanese knew the match was gone. In the dying minutes, Japan had their 2nd penalty corner. Varun saved on the line thus effectively giving himself the man-of-the-match award. Indian captain Manpreet agreed it was a slow start. "But we had more of the ball and should have got more goals. We wanted a winning start and we got one. Once we are back at the hotel, we will have a meeting and understand where we need to improve and be ready for tomorrow's match against South Korea." Aikman, the Japanese coach eventually agreed that the team that scores goals wins the match. "That is the essence of sport. There are no points given for creating better opportunities. But we are getting closer to India. That day is not far when we will beat them." Korea will not be easy opponents especially after their 6-3 thrashing of Canada. Six goals in the first three quarters showed signs of an extremely fit Korean side. India look sub-par. They need to raise their game, level of subtlety, show more threat up front, create combinations and reveal an all-round game plan that wasn't visible against Japan. 2018 at times was an exercise in inconsistency. It is time India started to change things. India defeated Asian Games champion Japan 2-0 to start its campaign at the Sultan Azlan Shah Cup hockey tournament on a positive note here Saturday. Varun Kumar converted a penalty corner in the 24th minute to hand India the lead before Simranjeet Singh (55th) scored a diving field goal from skipper Manpreet Singh’s brilliant pass to secure full three points for the five-time champions. India will play Korea in their next league game on Sunday before taking on hosts Malaysia (March 26), Canada (March March 27) and Poland (March 29). After a goalless first quarter, India slowly took control of the proceedings. Eight minutes into the second quarter, India won a penalty corner and Varun made no mistake in finding the back of the Japanese goal with a powerful dragflick. The Indian midfield manned by skipper Manpreet and Kothajit Singh stole the limelight by creating numerous scoring chances but the forwardline was guilty of wasting opportunities. Playing in overcast conditions with temperature hovering around 28 degrees, India continued its hunt for a second goal and earned a penalty corner within minutes of the fourth quarter. But this time Varun missed the mark, allowing Japan to launch a quick counter attack, which was kept at bay by Birendra Lakra’s alertness. IPOH: A brotherly act helped subdue a fighting Poland as Malaysia went ahead to win 5-1 in their opening Azlan Shah Cup match here on Saturday. Poland, who arrived a day before the tournament, defended stoutly for 15 minutes before Malaysia found their form in the second quarter. Faizal Saari scored off Malaysia's first penalty corner in the 20th minute while brother Fitri nailed a field goal in the 28th minute. It was Faizal again in the 30th minute to make it 3-0 before Poland scored off a penalty corner attempt five seconds from half-time. After the breather, Ashran Hamsani got the fourth in the 36th minute, and Faizal scored his well-deserved hat-trick nine minutes later. The win is a boost for today’s tough encounter against Asian Games champions Japan. "It is a good start to the tournament. I must thank Dutch penalty corner specialist Taeke Taekema for the training sessions in Kuantan," said Faizal on Saturday. Poland coach Karol Sniezek praised his players for their brave performance. “We could not match Malaysia. We are not at our best level as we only came here as a last minute replacement (for South Africa). “This is not our best squad. Five regulars could not make the trip due to other commitments,” said Sniezek. KUALA LUMPUR: Malaysia got off to a flying start in the Sultan Azlan Shah Cup hockey tournament by outplaying Poland 5-1 in Ipoh on Saturday (March 23). Faizal Saari was the toast for Malaysia, scoring a hattrick in the 20th, 30th and 45th minutes at the Azlan Shah Stadium. Faizal's younger brother, Fitri also netted a goal in the 28th minute. The other goal for Malaysia was scored by Mohd Ashran Hamsani in the 36th minute. The Polish players looked jet lagged as they only arrived on Friday (March 22), just a day before the tournament started. The Polish solitary goal was scored by Michal Kasprzyk in the 30th minute. In the first match of the day, five-time champions India edged Asian Games gold medallist Japan 2-0. Varun Kumar gave the Indians the lead in the 24th off their first penalty corner, before Simaranjeet Singh doubled the score in the 56th minute through a field goal. Indian skipper Manpreet Singh paid tribute to the opponents’ defence structure. "It was not an easy game as they defended very well and we lost the ball too easily at times. We need to improve our game as the tournament progresses and cut down on our defensive mistakes. "What really matters is that our tournament got off too a good start," said Manpreet. Lee Nam-yong netted a hattrick to steer South Korea to register a 6-3 win over Canada in the second match. Nam-yong was on target in the 19th, 31st and 43rd. Jang Jong-hyun converted two penalty corners in 20th and 44th, while Kim Jun-hoo scored in 14th. Matthew Sarmento (45th), Adam Froese (46th) and Fin Boothroyd (50th) replied for Canada. 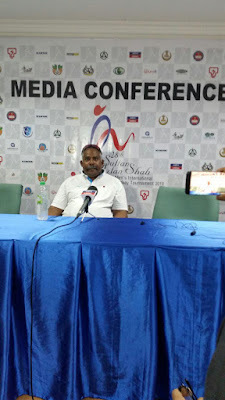 KUALA LUMPUR: Japan coach Siegfried Aikman said Malaysia died they day they lost the gold medal in the Jakarta Asian Games, and the team needs all the support it can to rise again. The Dutch said this after India beat Japan 2-0 in the curtain raiser of the 28th Azlan Shah Cup in Ipoh yesterday. Japan next meet Malaysia today (Sunday). "I hope the fans turn up in full force to support their team as Malaysia need all the help they can to rise from the bottom again. "They (hockey) died the day we beat them to the Asian Games gold medal in Jakarta, and by saying this, I mean their mental strength died that faithful day. "Malaysia reached rock-bottom in their hockey in Jakarta, and this is the best chance for them to rise again," said Aikman. 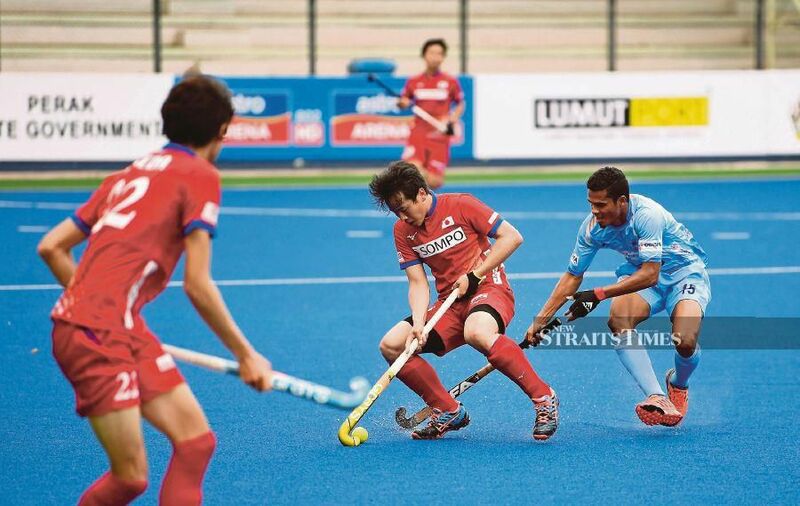 Japan played a solid defensive game against world No 5 India, who only got two shots at goal and scored both. India also could only win two penalty corners. "We lost 8-0, 9-0 and 3-2 to India in our last three encounters, so today's 2-0 was an improvement, and if we meet India again, we will beat them," said Aikman. The only difference in the match was Varun Kumar's 24th minute penalty corner, and Simranjeet Singh's diving deflection into goal in the 55th minute. "India are much better than Malaysia, and so I expect a better match from my players tomorrow (today). And I want the fans to show up in force, as my players would also benefit playing in an electric atmosphere," said Aikman. India coach David John did not attend the press conference and sent his skipper Manpreet Singh instead. "Japan gave us very little chances, and we took the few that came out way and won the match. I believe by the time they host the Olympics (2020), Japan would be ready to put up a good fight," said Manpreet. The Sultan Azlan Shah Cup is an opportunity. Has been for 36 years now. And India, still smarting from the 2018 Odisha World Cup disappointment in Bhubaneswar, will have done well to avail of the chance to regroup and tweak structure and style for the crucial Hockey Series Finals in Bhubaneswar in June where two Olympic qualifying spots are up for grabs. The invitational tournament, into its 28th edition, has been a epitome of Malaysia’s contribution to world hockey. It not only broke the long gap in the international calendar (before the Pro League’s inception) but presented participants team-building opportunities ahead of challenges ahead – the Olympic qualifying route being the focus this year. So India, in a state of disarray following the ouster of coach Harendra Singh after the World Cup, have gone into the tournament with performance director David John at the helm and Australian compatriot Chris Ciriello, the analytical coach at Bhubaneswar, his deputy. The duo hope to steady the boat even as Hockey India search for a foreign coach to replace Harendra. If the grapevine is to believed, another Australian, Graham Reid, is set to take over the reins. In Ipoh, where the six-nation tournament has already kicked off with India beating Japan 2-0 in the opener on Saturday, the team is devoid of a spate of first-choice players sidelined by injuries. That, however, provides the team the right scenario to galvanize itself in the wake of competition that, far from being pushovers, threaten to dispel any notion that a place in the final is India’s for the taking. Asian Games champions Japan restricted India to 0-1 with five minutes to go, conceding another goal after they brought in an outfield player in place of their goalkeeper. Their master tactician and Dutch coach Siegfried Aikman has eyes firmly placed on the 2020 Tokyo Olympics where Japan (ranked 17) hope to put in a monumental performance. South Korea (18) under coach Shin Seok Kyo are desperate to re-enter the top echelons fter missing two global majors – the 2016 Rio Olympics and the 2018 World Cup. Canada (10) bring a dint of hard work, determination and a craving for top-flight match practice into a lead up campaign to the Hockey Series and the Pan-Am Games that will decide their Olympic qualifying fate. Poland are in Ipoh with a mission to emerge from the wilderness, in the outdoor game at least. Last but not least, hosts Malaysia under legendary Dutch coach Roelant Oltmans want to go better than five silver medals at their own event, not to mention make up for the bitter disappointment of finishing 15th out of 16 at the World Cup. The Malaysians also want to make amends for defeat in the Asian Games final to Japan where they let slip a direct Olympic spot with just 13 seconds left. The Azlan Shah Cup, one suspects, will be Oltmans workshop to mould a team that could retrieve a ticket to Tokyo that agonizingly slipped away at the death in Jakarta. It all converged to wilting under pressure, the common factor in their major campaigns in 2018 that also included the Champions Trophy (loss to Australia in the final), Commonwealth Games (loss to New Zealand in the semis) and a debilitating defeat against Malaysia in the Asian Games semifinals in the shootout after conceding the equalizer 90 seconds from the end of normal time. With much less at stake in Ipoh than the high-pressure situation in Bhubaneswar, the team and its think tank would dare and do, one expects, challenging themselves at every opportunity to iron out the flaws that ended their campaign prematurely going by huge expectations before the event. Without the bulwark Harmanpreet Singh and co-defenders Chinglensana and Rupinderpal Singh along with forwards Lalit Upadhyay, Dilpreet Singh, SV Sunil and Akashdeep Singh, the team must look surely look at the flip side – that of building a broad base for international matches to compensate for the non-participation in the FIH Pro League at which participating nations have already a head start. Captain Manpreet Singh has the personnel to deliver the goods at Ipoh but must surely look far beyond. The hard-working midfielder will be glad to have Vivek Sagar Prasad back to assist him in the supply line to a depleted forward line, weakened further with an injury to the promising Gurjant Singh. The onus will however be on the experienced Mandeep Singh who will need every support from the profusely talented Simranjeet Singh. (Pic: India outplayed Japan for 8-0 in Jakarta last year) Manpreet, though, will justifiably count on his defence where the veteran goalkeeper Sreejesh and deputy Krishan Pathak along with defenders Amit Rohidas, Birendra Lakra, Varun Kumar, Surender Kumar and Kothajit are expected to hold fort with aplomb. With four outright triumphs and one shared title (with South Korea), India would want the Azlan Shah campaign to infuse energy into a qualifying campaign that would lead to, one never knows, a special moment at the Olympics. Ask the Aussies. The Olympic title was their holy grail. They finally found it at Athens 2004. Along the way the Kookaburras left one with the conviction that it was going to be their time. Much stemmed from the Azlan Shah Cup won in a rousing victory over Pakistan in the final. Graham Reid and AH&BC Amsterdam have parted company with immediate effect with Jan Jorn van 't Land taking over the coaching role for the remainder of the season. It follows a tough season to date which culminated in an 8-2 defeat at home to HGC last weekend, dropping them to sixth place with six points to make up to the playoff spots. “The current disappointing results emphasise the need for change. In addition, Reid has indicated that he may have a new challenge in the short term outside of Amsterdam. The combination of these factors led to this decision," the Amsterdam board said in a press release. Hockey.nl suggests there is interest in Reid from India who are currently involved in the Sultan Azlan Shah Cup with the Asian side without a coach since the World Cup. The other alternative suggested is that Dutch national coach Max Caldas is on the look-out for a new assistant coach. Reid was a long-time assistant coach with Australia and took over as head coach in 2014. After the Olympic Games in Rio de Janeiro (2016), he became the assistant coach of the Dutch men and head coach of Amsterdam. He had a contract with both parties up to and including the Tokyo Games in 2020. In his first season as coach of Amsterdam, he made the play-offs, only missing on the grand final in their last leg against Kampong. Amsterdam will play Grove Menzieshill in the EHL KO16 on April 18 in Oranje-Rood. Elsewhere, Beeston won 2-1 at home against bottom of the table Canterbury. Second-placed Leicester produced a good performance, winning 5-1 at the University of Durham. Olive Hepi, Katie Mason, Jodie Conelly, Stephanie Hale and Elizabeth Honarmand were all on the scoresheet for the away side. Tess Howard scored a consolation for the University of Durham. Stourport are Investec Conference West winners following a 4-0 win at Barnes on Saturday. Sarah Parkinson-Mills gave them the lead in the sixth minute with a goal from a penalty corner. Lizzie Pocknell doubled the away side’s advantage with a goal in the 41st minute before Lorna Mackenzie made it 3—four minutes later. Lottie Atkinson sealed the win with a goal from open play in the 52nd minute. Swansea City took a step closer to securing a place in Division One for next season with a 4-2 victory at Olton & West Warwicks. Goals from Beth Fisher, Carmen Ansley, Sarah-Jayne Throrburn and Livvy Hoskins were enough to clinch the win for the away side. 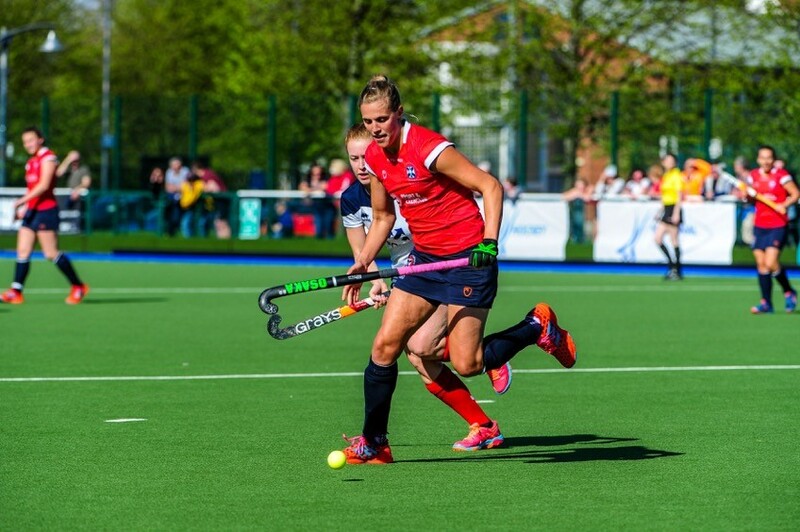 Hampstead & Westminster moved a stop closer to securing the title in the Investec Women’s Conference East with a 5-0 at Southgate. The result means they need a win on the final day to seal the crown. Goals from Melanie Wilkinson (2), Lauren Turner, Amy Askew and Meg Byas were enough to seal all three points for the away side. Wimbledon remain two points behind the leaders after winning 4-0 at Ipswich. Rosie Pickersgill, Hannah De Selincourt, Sophie Bowdon and Kate Maxey were the goalscorers for the away side. 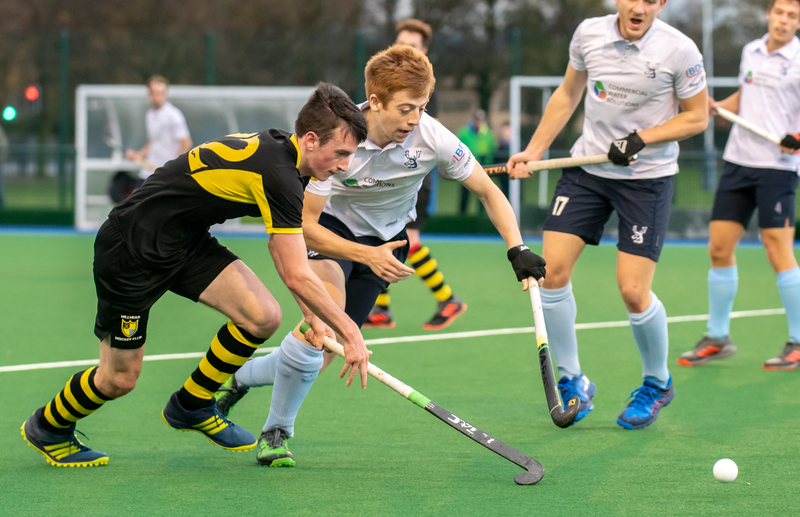 Grange are officially the Scottish men`s National League 1 champions after a 4-1 victory over Hillhead at Fettes, they now cannot be caught by either Western Wildcats or Grove Menzieshill. Meanwhile Edinburgh University still hold a two point lead over Clydesdale Western and Western Wildcats at the top of the women`s National League 1 with Dundee Wanderers a point further adrift. The foundation for Grange`s victory was a three goal cushion scored late in the first half. The contest was goalless for the opening 25 minutes, but then Alan Johnston put the champions ahead at the far post after the penalty corner routine had broken down. The second came five minutes later with a direct penalty corner strike from Frank Ryan. Minutes from the interval a move involving Ryan and Todd Mills created the danger, the result was a penalty, and Robbie Shepherdson converted from the spot. In the second half Hillhead pulled one back, great work down the left by Graeme Campbell created the opening and Andrew Black provided the final touch. But any comeback was stifled by a Todd Mills fourth from a rebound to seal the three points and the title. Western Wildcats fell from grace after going down 4-3 to Uddingston at Bothwell Castle Policies, the result keeps the Lanarkshire side in fourth position. Aussie Brad Hughes scored twice for the home side with Josh Cairns and Ben Ferguson getting the others. The Western Wildcats scorers were two open play strikes from Fraser Calder and a penalty corner conversion by Hamish Galt. The crucial clash between Watsonians and Clydesdale was goalless at half-time, but the Glasgow side emerged comfortable 6-1 winners in the end. The result takes Clydesdale out of the relegation play-off zone, but leaves Watsonians firmly in it. In the second half goal avalanche, youngster Struan Walker was the catalyst with four, Aidan Black got another while the last goal came from 15-year-old Ben Galloway. Edinburgh University moved up to fifth spot, only two points behind Uddingston, after a 5-0 home win against Grove Menzieshill. Ian Moodie was the hero with four while Kevin Wong got the other. Edinburgh University continue to retain top spot in the women`s National League 1 after a comfortable 5-2 win over Grove Menzieshill, Zara Malseed got two while the others came from Sophie Maunder, Hanna McKie and Bridie Marlow. Clydesdale Western retained their second spot, still two points adrift of the students, after seeing off Watsonians 5-1, the highlight was a hat-trick from Heather Lang. Western Wildcats only trail Clydesdale on goal difference following a 3-0 win at Glasgow University. Emily Powell scored the only goal of the first half when she finished off a good move that opened up the students` defence. In the second half a good through ball from Alex Stuart found Powell for her second of the contest. Another flowing attacking move from Western Wildcats left Lucy Findlay with the task of tapping the ball into the net. Dundee Wanderers are still in fourth spot after beating GHK 6-1 on Tayside. Sophia Free opened for Wanderers, Ava Smith levelled for GHK, but by the interval the Taysiders were 3-1 ahead through a solo goal from Charlotte Watson and Jess Ross at an overtime penalty corner. That is how the score line stayed until the final ten minutes, Watson scored her own second with another solo run and shot, Heather Elder made it five, and in the closing minutes veteran Vikki Bunce added her name to the goal tally. Hillhead moved to the top of the relegation area with a 3-1 win over Grange. The Gryphon Tokyo Cup launched a women’s event for the first time this month when the annual tournament took place in Japan. After the success of last year’s competition, where two Japanese clubs battled against a Gryphon world team, sponsors opened up the event to its female ambassadors. Two of the top female teams in Japan – Coca Cola and Waseda University – played against a Women’s Gryphon side and an Uru Sports world team, alongside the men’s event. “The introduction of the women’s competition was an obvious step in pursuing absolute equality within the sport,” said a spokesperson. Gryphon invited Uru to join the 2019 tournament based on the elite level of players using the recruitment platform and its international network. “Many people want to experience the world through hockey but aren’t able to commit to a six-month season abroad like other Uru athletes,” said Naomi Evans, former Hockeyroo and co-coach of the Uru World Team. Australian International Kathryn Slattery, who was joined by Argentina’s Martina Cavallero, said the tournament was an “incredible experience” at Waseda University. The winners of the Cup were the Gryphon team for the women and Meiji University for the men. Both finals ended in an exciting shoot out. 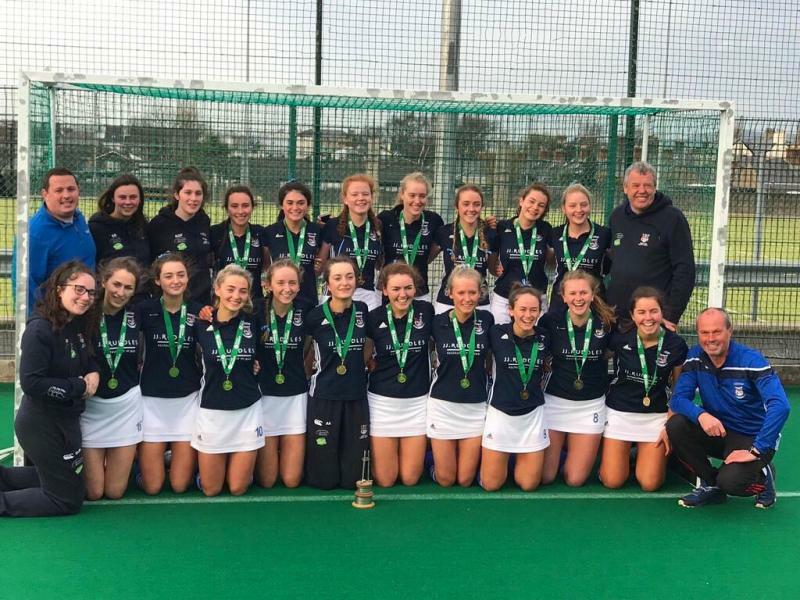 Crescent Comprehensive endured a nerve-wracking two-hour wait to finally be crowned the Kate Russell All-Ireland Schoolgirls Champions on goal difference. They edged out Banbridge Academy at the head of the table as well as St Andrew’s College and Kilkenny College. It means the two All-Ireland schools titles will reside in Munster at the same time – following Newtown’s October win on the boys’ side – for the very first time. They shared the lead with Kilkenny overnight but stormed clear early on the second day of the campaign. Leah Clery scored a hat trick – including two penalty strokes – for a confident 6-1 win over Galway’s Colaiste Iognaid. Her first came in the third minute and it set the tone for a comprehensive victory as first half goals from Sophie Clein and Aoife Hickey were augmented by Clery and Clare O’Meara. That left them clear at the top and they could have won the title had they taken one of their chances against Kilkenny College in the second game of the day. Crescent could only draw 0-0, though, as they found the final touch just missing as they held most of the play – in a similar style to their tie with Bann – while Ellie McLoughlin showed her ability between the posts. It left the door just about ajar for Banbridge Academy and Kilkenny to overhaul the Limerick school on goal difference. First up, Bann needed to beat the Jes by at least five goals and were 1-0 up at half-time but only two goals came in the second half and so their challenge ended unbeaten on eight points. Kilkenny, then, needed to beat St Andrew’s by a comprehensive margin but classy goals from Martha McCready and Alex Orr saw the hosts win out 2-0 to nick bronze. For Crescent, it meant they could finally celebrate their second success in five years and was achieved in spite of horror injuries to Sarah Barry, Aoife Hickey and Elle Sorensen during the tournament. Reflecting on the two days, Duggan – who was assisted by Limerick hurling legend Gary Kirby – said there a number of key moments. “Our whole tournament hinged on that opening win over St Andrew’s and we had everything set towards that. We edged that and it set us up. We felt a bit down after the draw with Banbridge at the time but it was a huge result in the end. “It’s massive,” Duggan said afterwards. “Not just for us and Limerick but for Munster, it shows we are well able to compete on the national stage at such a good tournament. “Last year, we lost in the Munster final but we had a lot of predominantly transition years so I thought we might have a chance this year or next but we snuck it through.